Much of Gippsland has been suffering severe rainfall deficiency over the last 2 years. Anecdotal evidence from the upper Tambo Valley suggests that some farmers have been feeding out for most of that time with bills for their hay purchases up to $1000 per week. The long term rainfall pattern in Gippsland shows a 25% reduction in winter and autumn. As I have noted on many occasions when and where rain will fall is the hardest thing to predict – especially rainfall in thunderstorms where one location may receive a downpour of a few inches and a dozen miles up the road they receive nothing. Most Gippslanders are aware that our heaviest rainfall events are from the east and south-east commonly delivered by ‘east coast lows’. Invariably Gippsland floods are associated with these easterly rains and the possibility that the current drought will be broken by a heavy rainfall event must be high. It has happened before – in 1998 when a short sharp drought was ended with June floods. This time the predictions are for summer rains. The apparent paradox that climate change is making both dry and wet periods more extreme and more frequent is sometimes confusing. As our climate becomes hotter it increases evaporation making it dryer and, with the subsequent loss of soil moisture, the drought worse. Extended dry spells are probably being enhanced as the tropical areas expand and are gradually forcing our predominant westerly winds further south. On the other hand each degree of ocean warming puts 7% more moisture into the atmosphere. Onshore winds from the south and south east can dump this extra moisture over Gippsland. I have made a number of previous posts illustrating the oceans warming off our coast including the recent arrival of black marlin and other warm water species off our shores. Thus global warming increases the extremes of floods and drought. The best outcome possible for Gippsland is that the drought is broken by a series of long, but gentle, rainfall events. 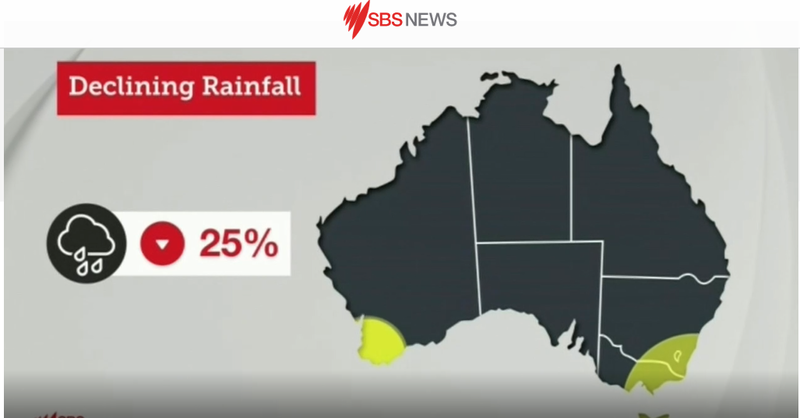 The worst case scenarios include missing out on the rain altogether, the drought broken by severe floods in the holiday season and, perhaps worst of all, the drought broken by floods followed by bushfires after a post flood heatwave. As time passes and little is done the odds are increasingly on the worst cases.